Last October my friend Michelle and I decided to celebrate our birthdays, which both fall in that month, at Osteria Mozza. We made our reservations a month ahead, as required, and waited with anticipation for October 5th to arrive. 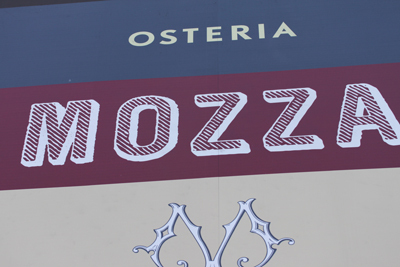 Mozza holds a special place on my restaurant list because Nancy Silverton is one of the owners, and I did my cooking internship for culinary school at Campanile, where I saw her every Saturday, for nine months. She is my culinary hero, whom I admire as a chef and business woman. Her book Desserts is my pastry bible and my go-to dessert recipe tome. So I was really looking forward to eating where she was one of the creators. And Mario Batali isn’t bad either. 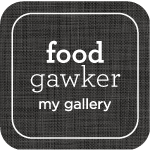 There was that little foodie groupie in me that was secretly hoping one of them might be there. Ya, right. The restaurant is in Los Angeles, on the corner of Melrose and Highland, and a long drive on the freeway from Manahattan Beach, where we live. We overestimated how long it would take to get there, and arrived 30 minutes early. After valeting the car, we took a little walking tour around the corner to Pizzaria Mozza and the little Italian Shop inside it. The clerk said Nancy Silverton personally chose and imported all the items from Italy. I ended up buying a 17.5 oz. package of Fregola Sarda pasta for $12.00, which is about 2 cups of little pasta balls the size of Israeli couscous that have been browned in the oven. Ok, it’s a tourist trap and I caved. But I’m hoping to cook them in the future and do a post about them. Finally it was time for the front doors to be open. 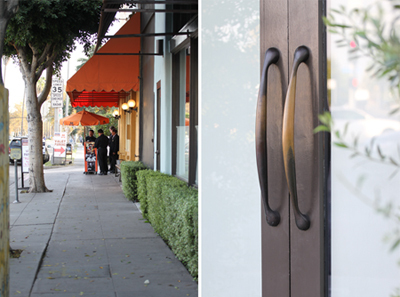 We went in and the whole server staff was standing in the entry, with their striped shirts and long white aprons. They gave us a little bow, and one stepped forward and said, “Where have you been? We’ve been waiting for you!” They must have seen us hovering around outside. Oh well, we were tourists, after all. 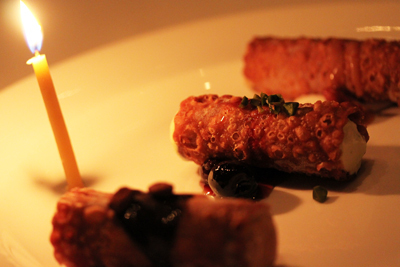 Or server graciously agreed to seat us by a window so I could photograph the food. I had only had my camera for a month and was a total novice. The photographs are all out of focus, so don’t laugh, ok? I did my best. 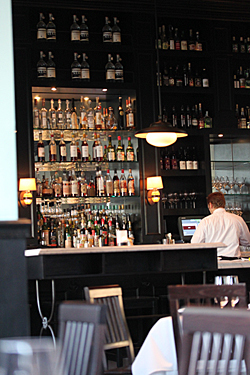 The restaurant is black, white and chrome and has a very slick look to it. The mozzarella bar runs the whole length of the room and you can pull up a chair and eat there if you like. The liquor bar is against the far wall and it is all twinkly like a big Christmas tree. 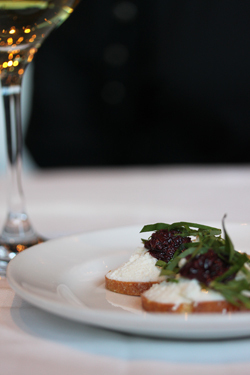 We ordered our wine and it was served along with an amuse-bouche, a Kalamata Tapenade Crostini, which is obviously where I got the idea for the recipe in this post. I have made them numerous times and they are so amazing. The salty olives, creamy ricotta and La Brea Bakery sour dough bread topped with basil shards. I thought I had died and gone to heaven. We ordered our starters and entrées, and I took photos of everything. It was a Monday night, so there weren’t very many people there, although more arrived as the night went on. Finally our dishes arrived. They were so beautiful, I almost didn’t want to start eating them. 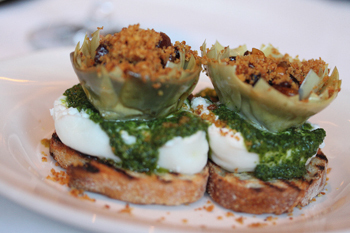 Michelle had Burricotta with braised artichokes, pine nuts, currants and mint pesto. 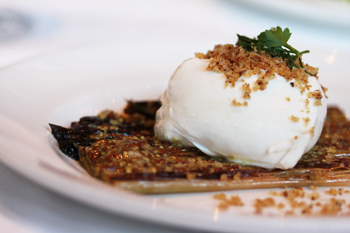 I had Burrata with leeks vinaigrette and mustard breadcrumbs. It was very intense with the flavor of the stone-ground Poupon-style mustard. Too intense, really, but I ate it any way. I was at Mozza! and I didn’t want to miss any of the flavor experiences. 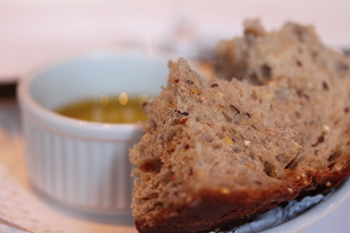 We had also been served some great rustic bread that was full of wheat berries and seeds, which we dipped in the peppery olive oil. It was chewy and wonderful. That bread inspired me to try to make some of my own rustic bread about a month later, and it was a dismal failure. It turned out like a solid football, which could have been used for a doorstop. I’m not going to tell you that story though. Then came the entrées. Big plates of meat. Perfectly medium rare the way I like it. Whoever was working the grill really knew their stuff. 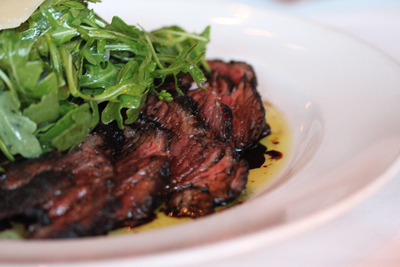 Michelle had Grilled Beef Tagliata, rucola and Parmigiano with aceto balsamico. 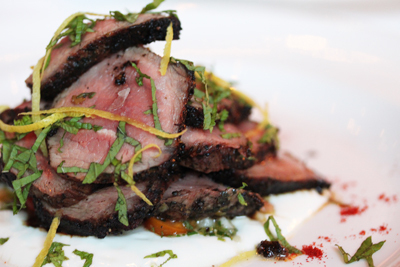 And I had the Grilled Leg of Lamb with insalata di Fregola Sarda, mint and yogurt. The pasta and minty yogurt were hidden under the lamb slices and was a wonderful sauce for the lamb. And, lo and behold, there was the Fregola Sarda, which I had just purchased in the little shop. Well, we were totally stuffed by this time. You know, groaning with happiness. Michelle said we had to have dessert because it was our birthday, so she ordered Cannoli with caramel, pistachio and espresso gelati. When it came to the table it had a little birthday candle stuck to the plate. It was so cute! We said our good-byes to our server, who had been very charming and helpful. The whole evening had been like living a fantasy. We walked out saying WOW, that was really something to remember. And I could hardly wait to get home and look at the photos. And think about writing this post, which turned out to be five months later. 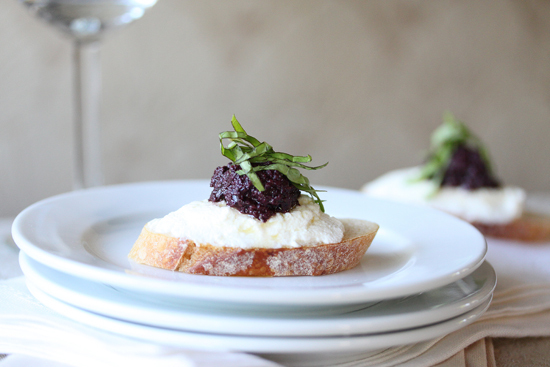 So here is the recipe for the Kalamata Olive Tapenade Crostini. When you eat it, you can pretend you are at Osteria Mozza, just like I do! 4. Slice the baguette diagonally into ¼-inch slices. 5. Top each slice with about 1 tablespoon of ricotta, making a small depression in the middle in which to place the tapenade. 6. Scoop about a tablespoon of tapenade on the blade of a knife. Push the mixture down the knife with a finger to form a ball shape and place it in the depression. Top with basil. Gorgeous shot of the crostini. From afar, the kalamatas resemble caviar I love taking pictures of food before eating and like you, I am the one sitting in a restaurant snapping away! Previous post: OMG! 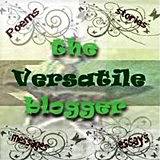 I’ve Been Published in a Magazine!